Joe Praize is bringing Frank Edwards and Nikki Laoye together in a collaboration which is the first work to be released officially from the new colourful Coast2Coast studio. This single that brought these three Gospel music giants together is aptly titled “Strong Together” …No other title would have fitted in better. The song is dedicated to Nigeria and it is timely with the elections around the corner. “I recently made a trip to the United States of America and in the course of my activities there I began to think of what we could do to help foster peace and unity in our nation NIGERIA especially among our youths… In this very trying moments in our democracy I have come to love my country nigeria the more knowing that there is a brighter tomorrow that can only be achieved when we all understand that we are STRONG TOGETHER. Joepraize an International Gospel Artiste based in Lagos Nigeria collaborates with two gospel music giant in Nigeria who are ambassadors of various national reputable bodies. 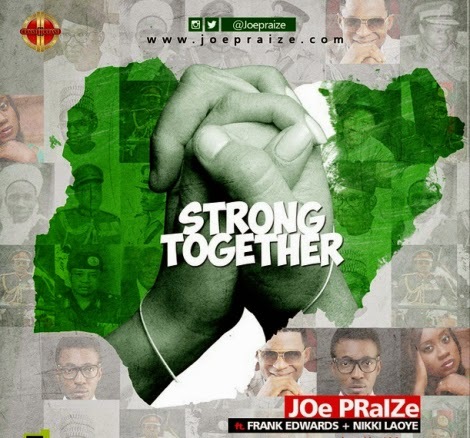 Joepraize featuring Frank Edwards , an INEC peace ambassador and Nikki Laoye Voice of Refugees (NCFRMI S/W) in a song titled STRONG TOGETHER.